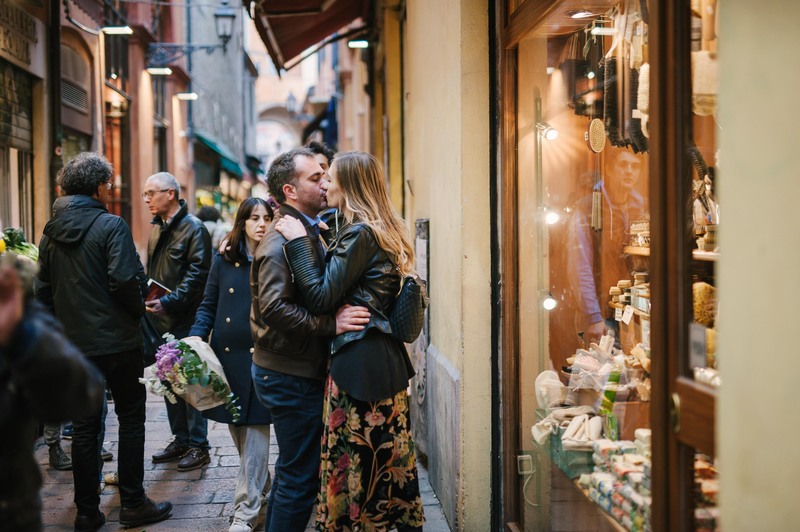 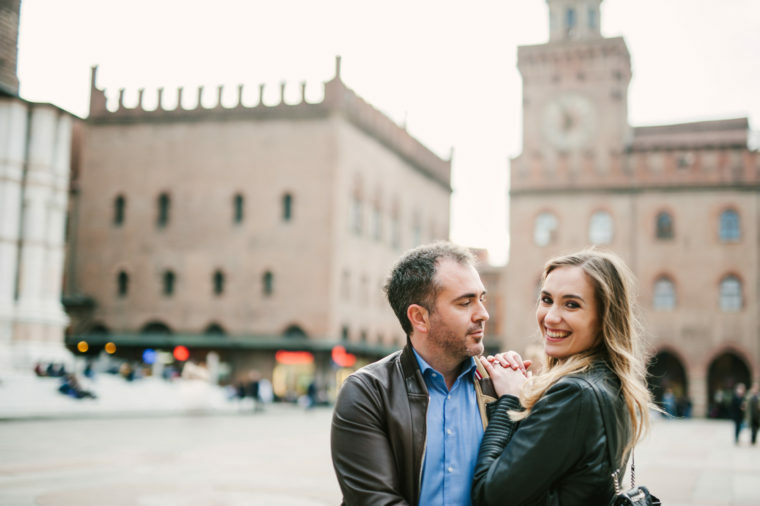 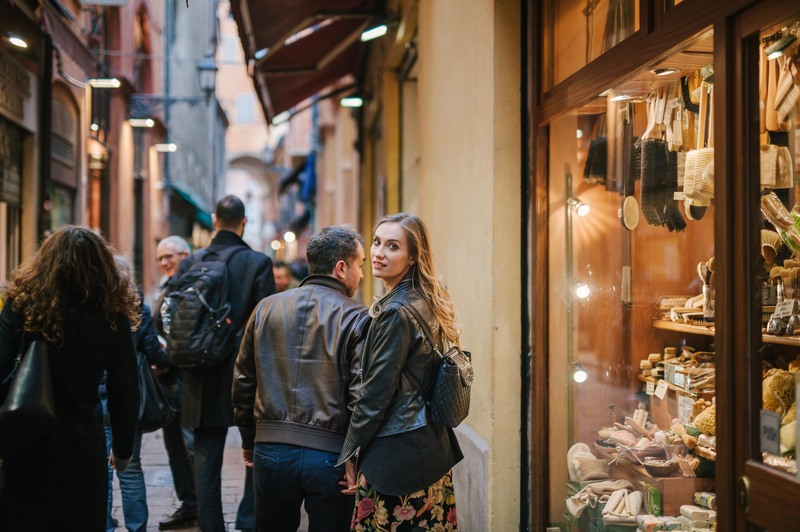 There are many beautiful and romantic cities in Italy, suitable for taking city engagement photos, and Bologna is definitely one of them. 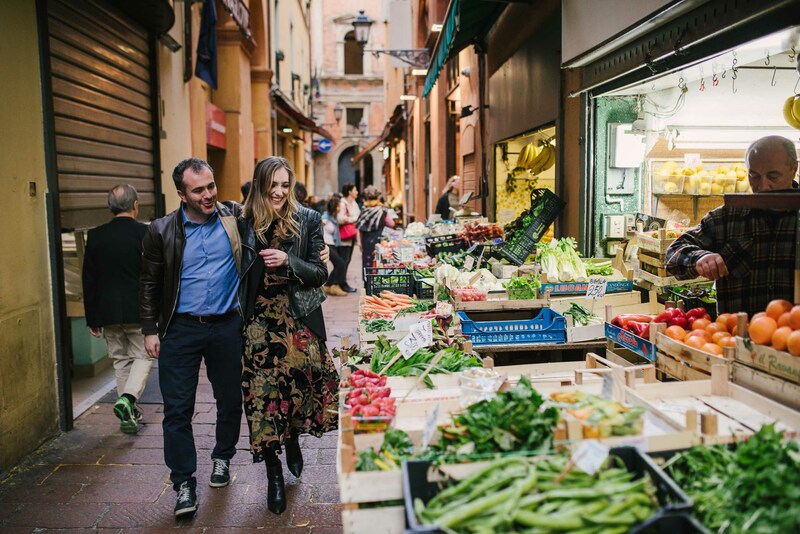 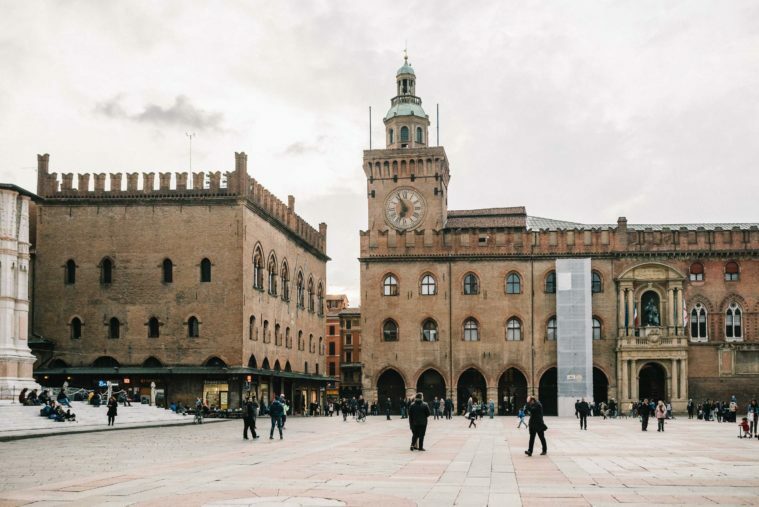 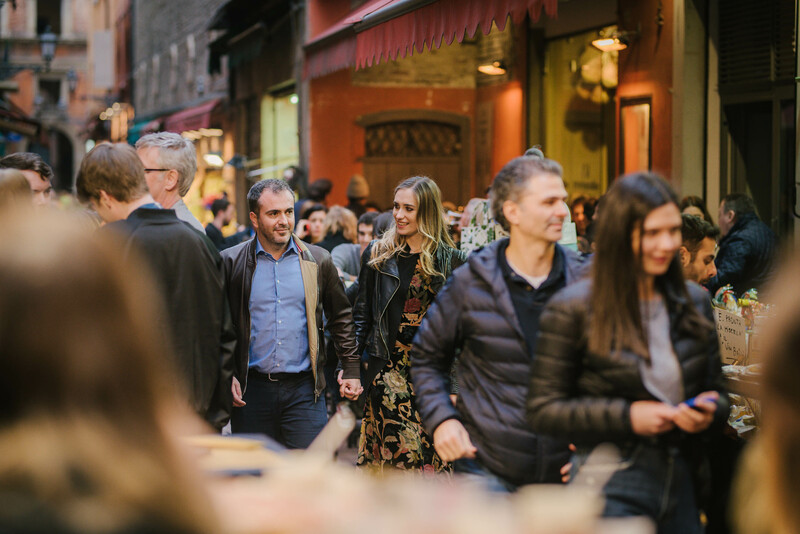 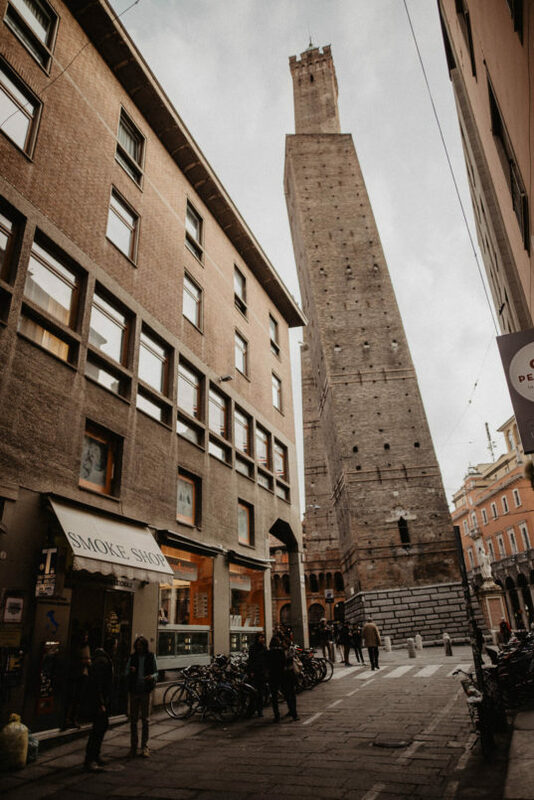 Although this lovely town is maybe most known for its wonderful food, Bologna is actually an astonishing city that brings together the medieval charm and a joyful modernity. 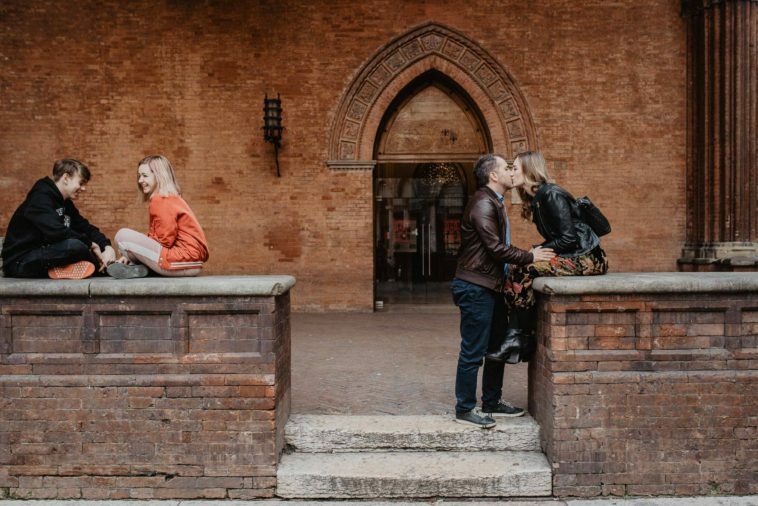 That’s probably the reason why this romantic city photoshoot is so powerful and make us feel all the joy and passion that this beautiful couple has inside. 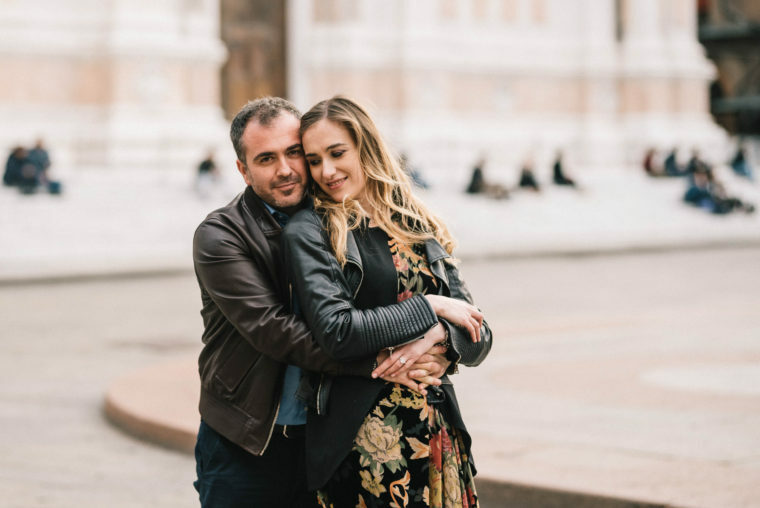 Alessia and Stefano come from different places. Alessia is from Valtellina, in the north of Italy (Lombardia) and Stefano from Parma, not far from Bologna. 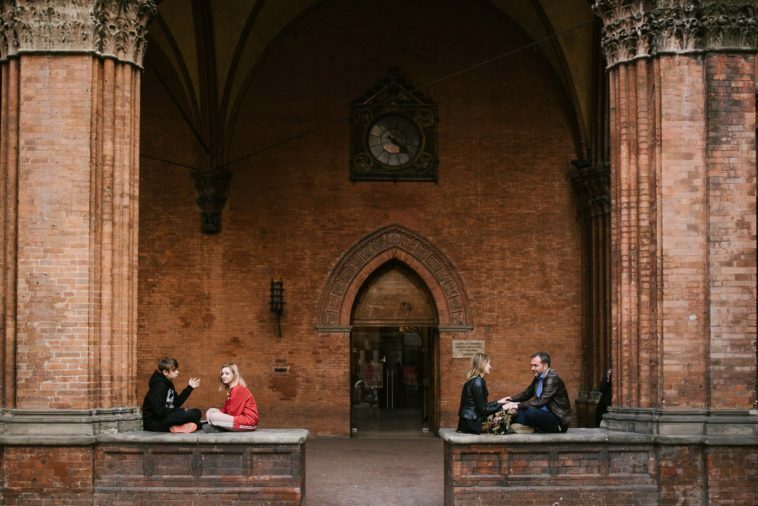 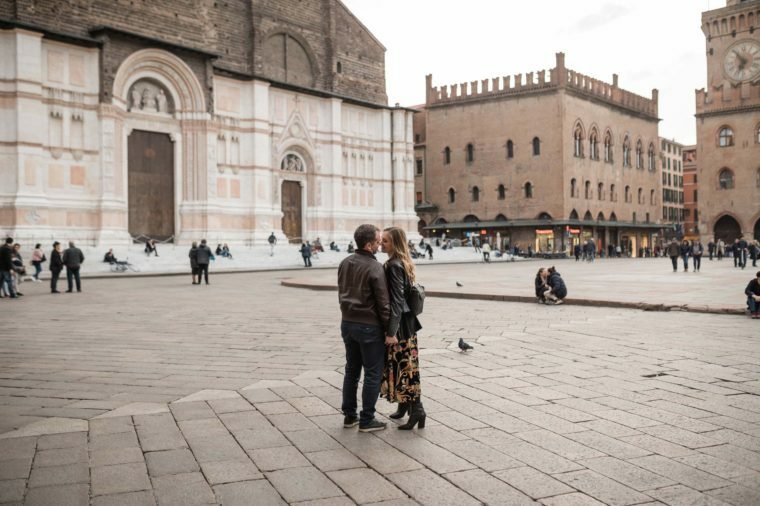 They moved to Bologna to study and work, and this is where their love began. 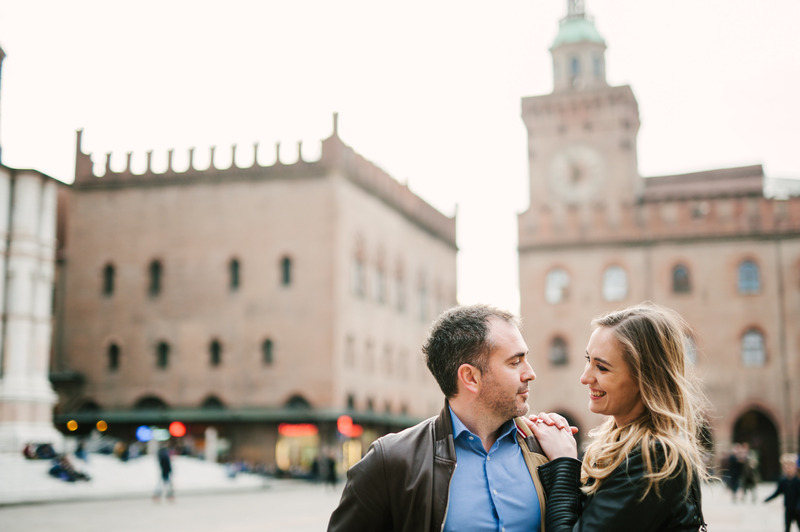 They met each other one night seven years ago, in a small nice bar in the city centre, the “Marsalino”. 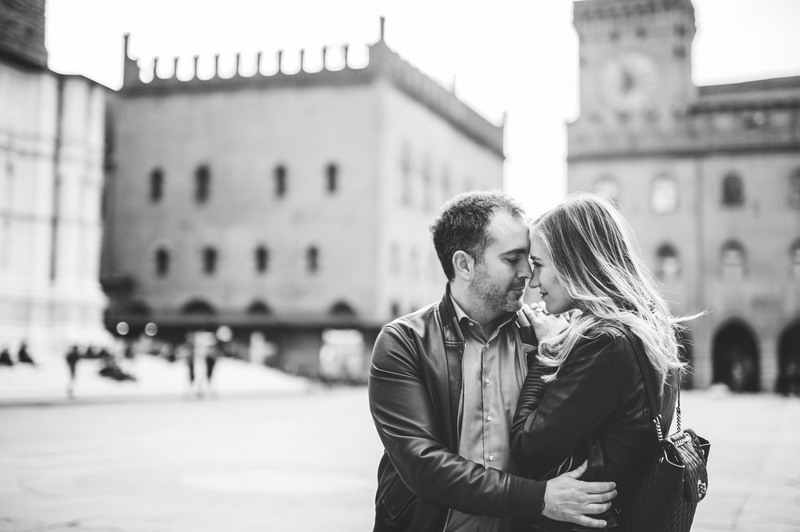 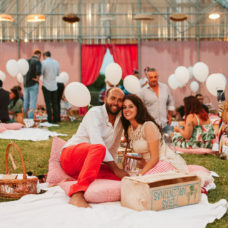 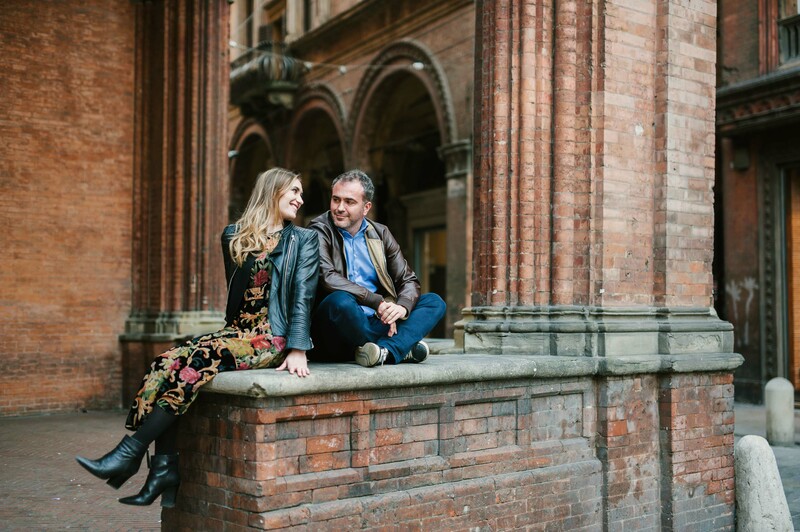 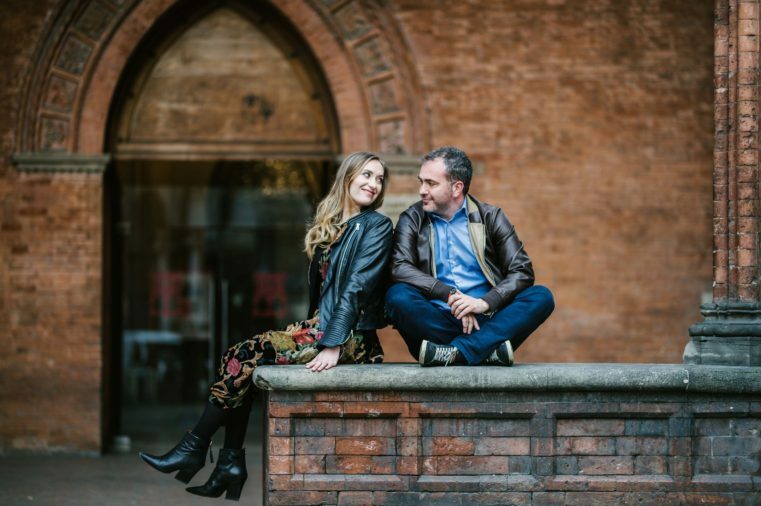 Since then they’ve lived together in this town, and that’s why they decided to take their city engagement photos in Bologna, although they are getting married in Parma. 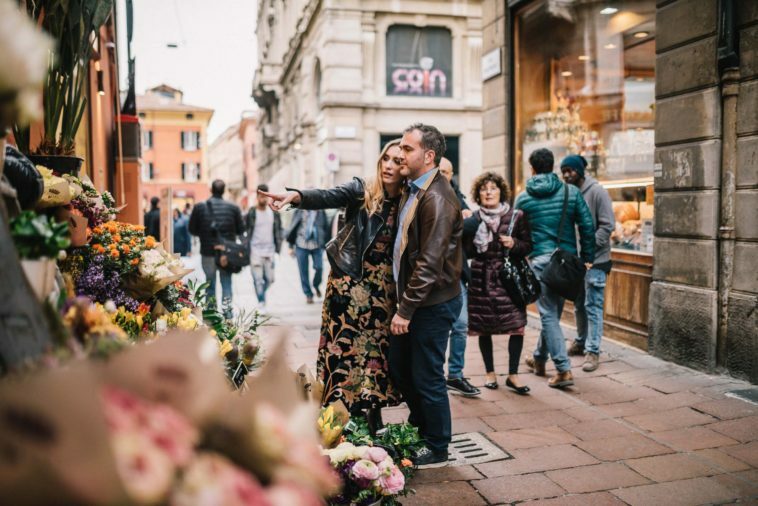 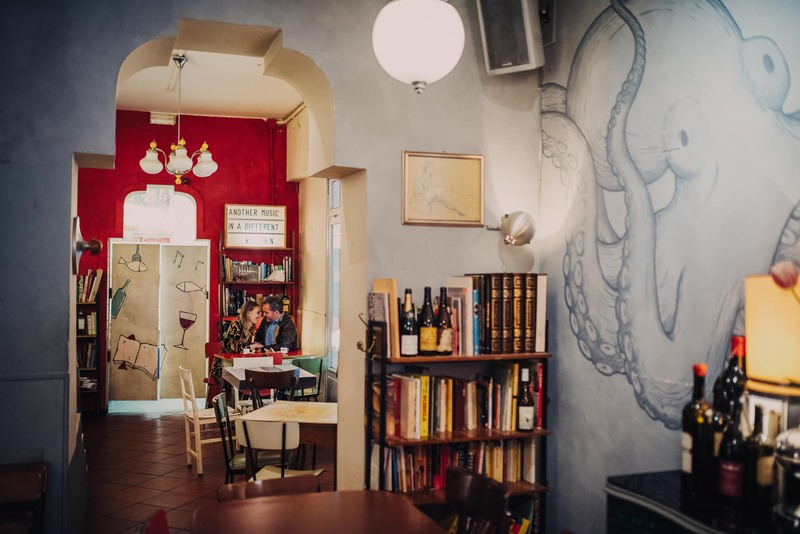 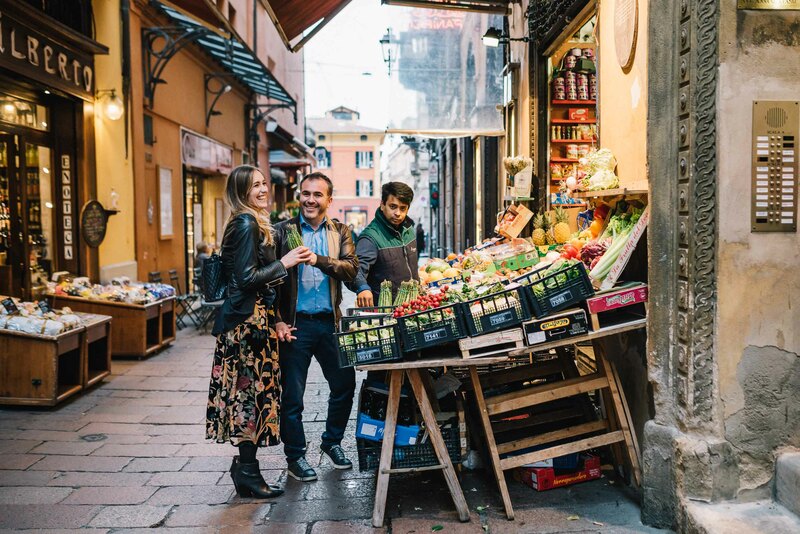 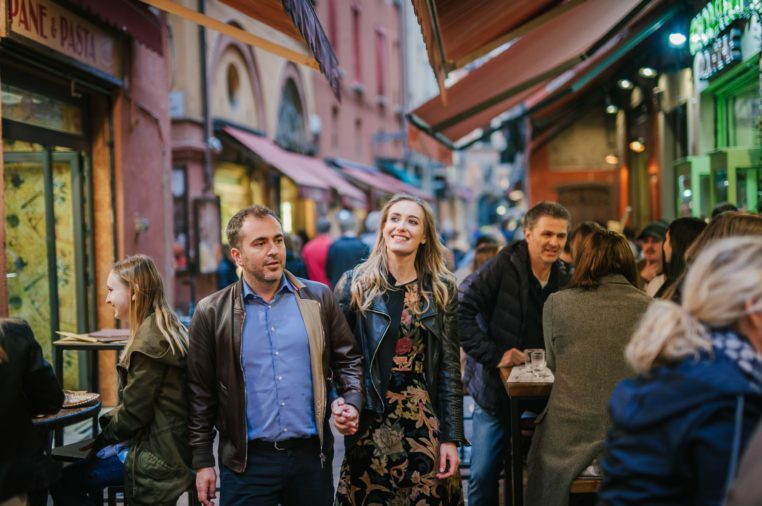 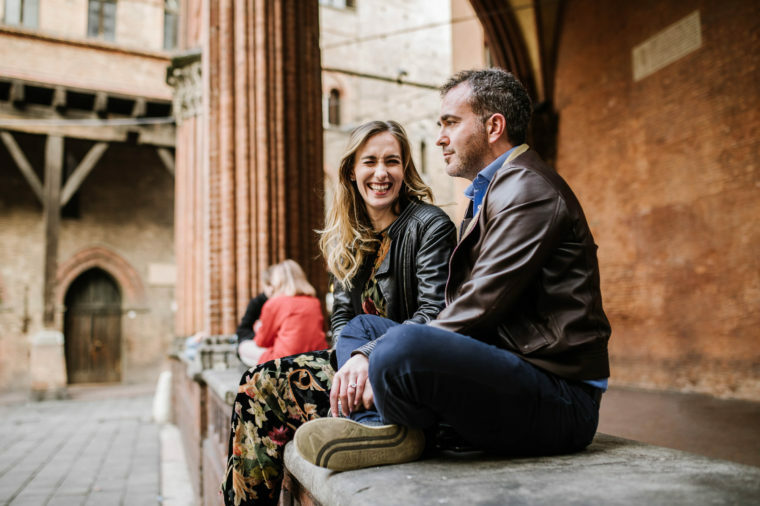 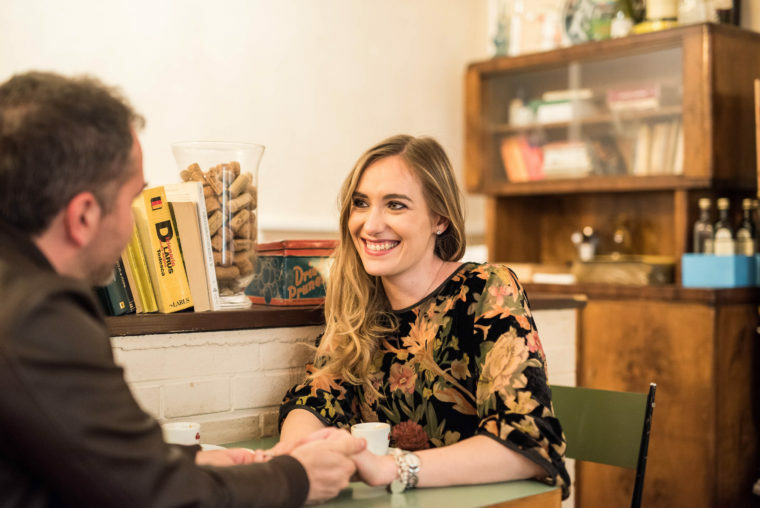 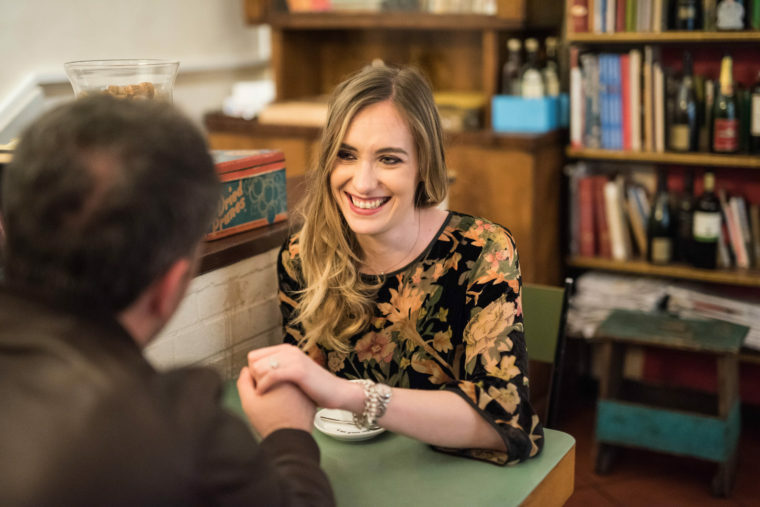 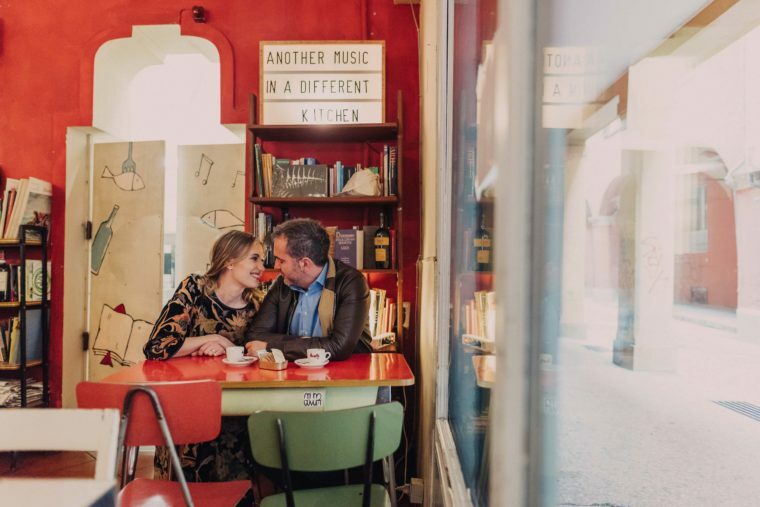 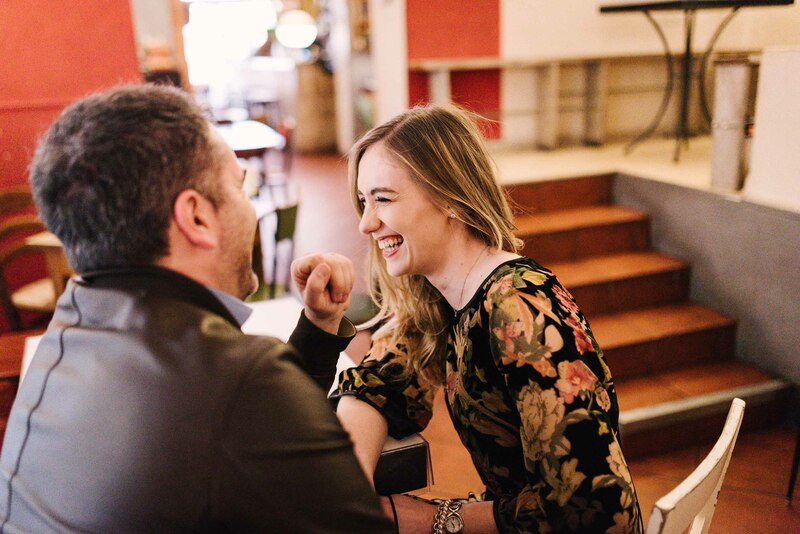 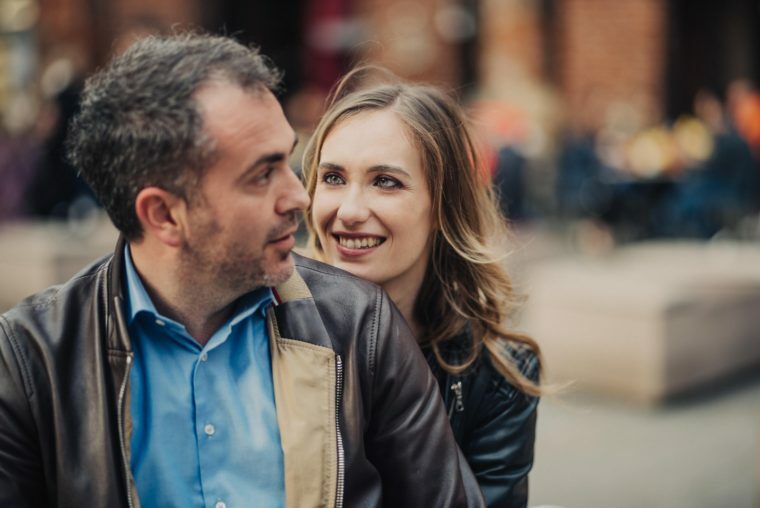 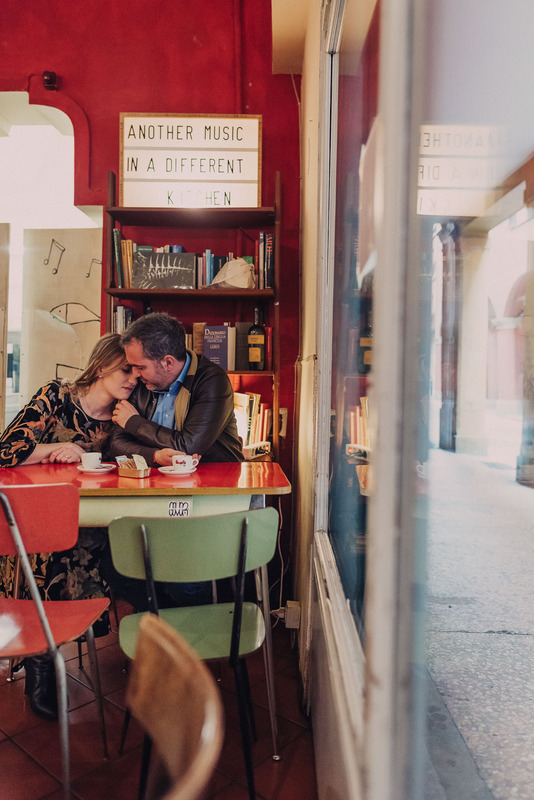 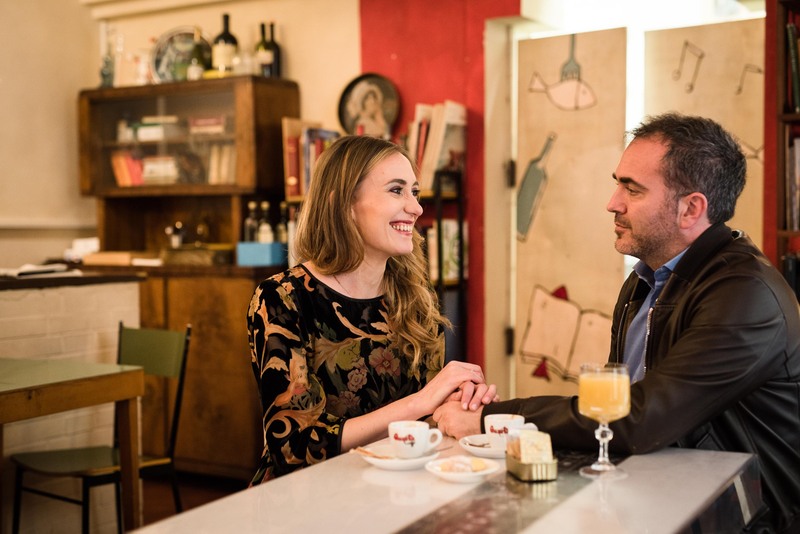 We took this romantic city photoshoot in the historic center of Bologna, starting with an Italian coffee in a very special and cozy bar, Camera a Sud. 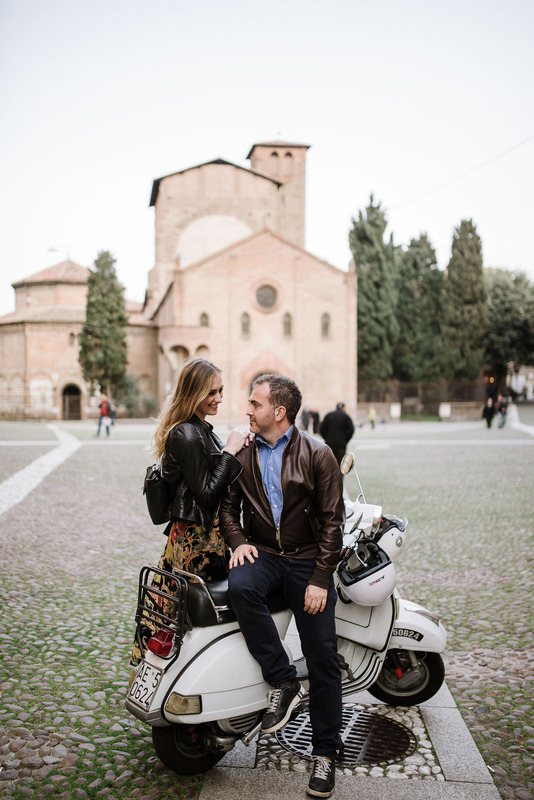 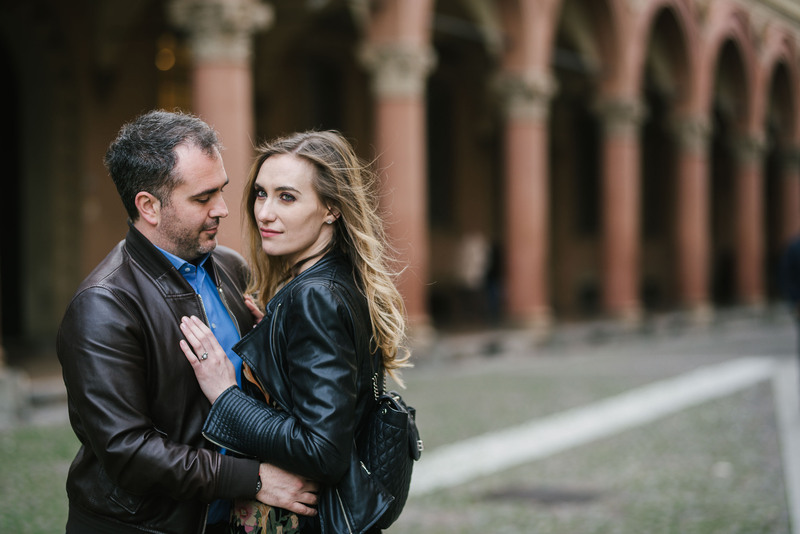 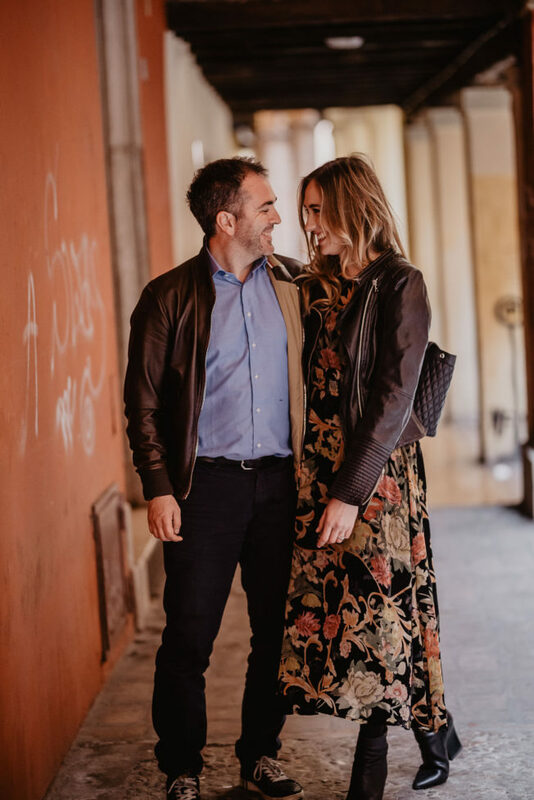 Then we went to the nearby ancient Jewish Ghetto, we moved to Piazza delle Mercanzie and we reached the gorgeous Piazza Santo Stefano: the famous Basilica with its seven churches standing out in the grey autumn sky created an amazing landscape for the pictures of this lovely couple. 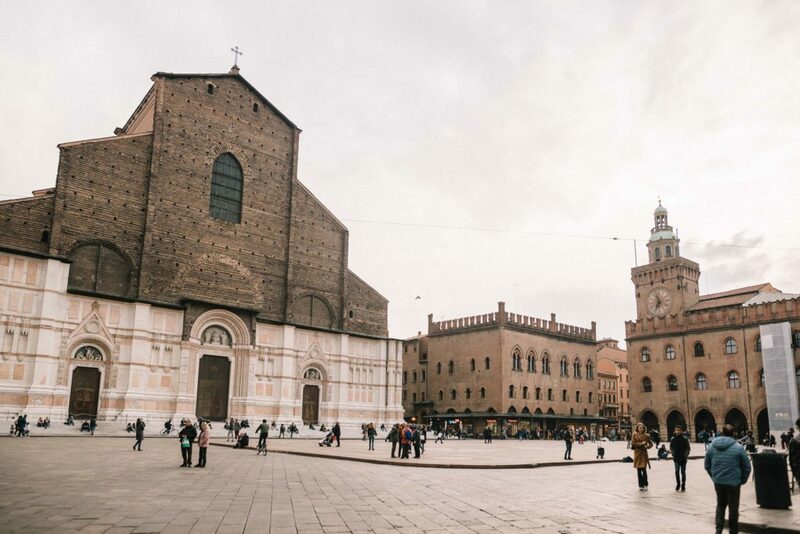 Our trip continued into the lively and colorful streets of the Quadrilatero, up to the majestic Piazza Maggiore. 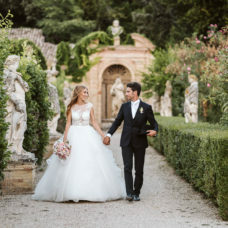 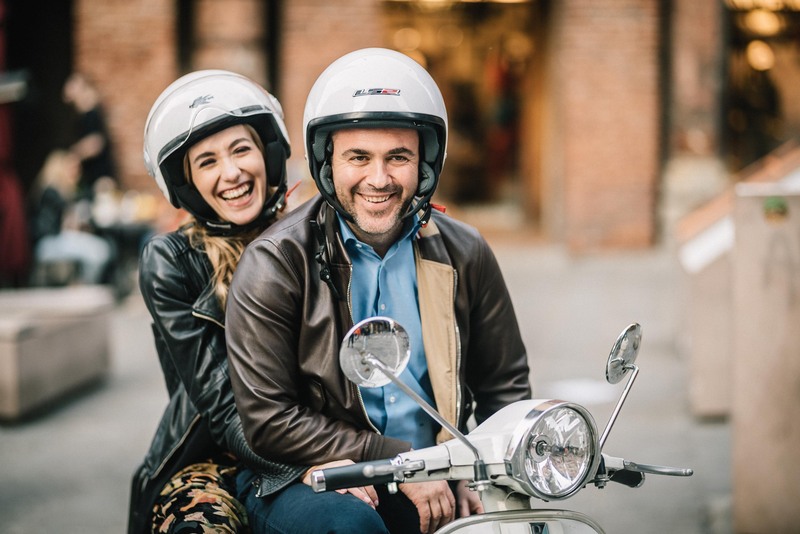 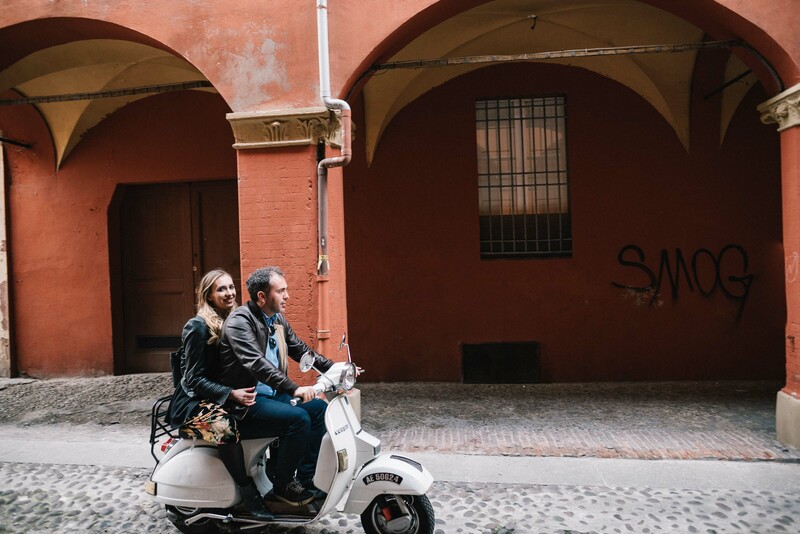 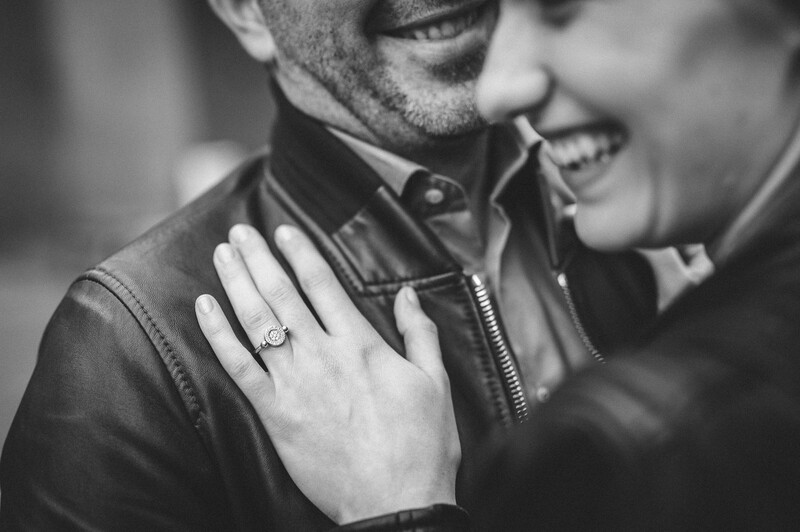 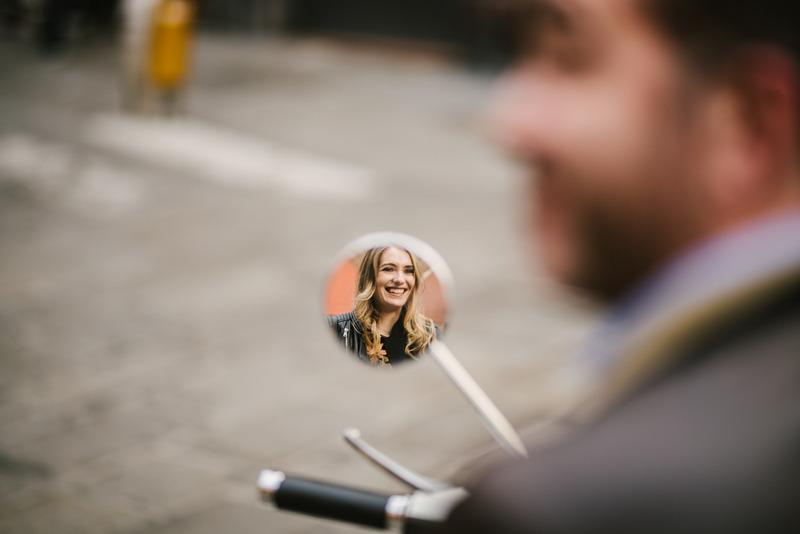 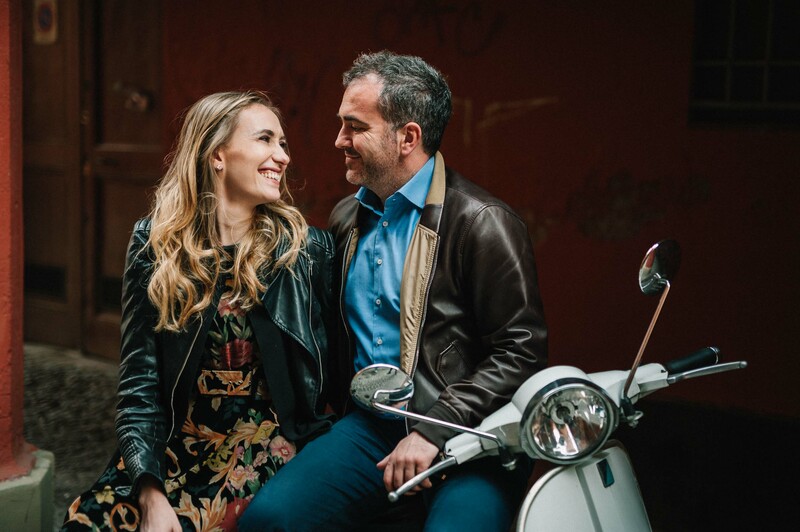 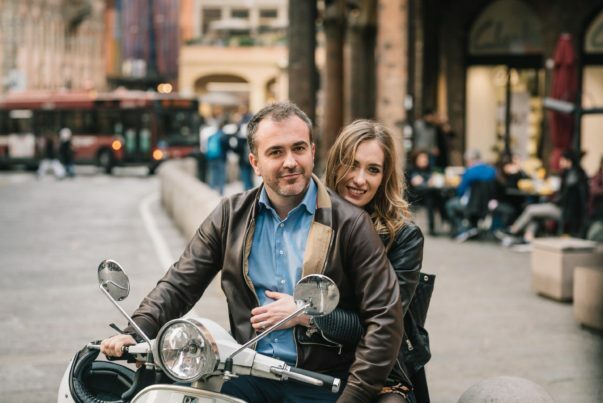 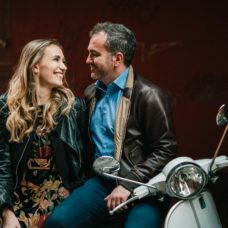 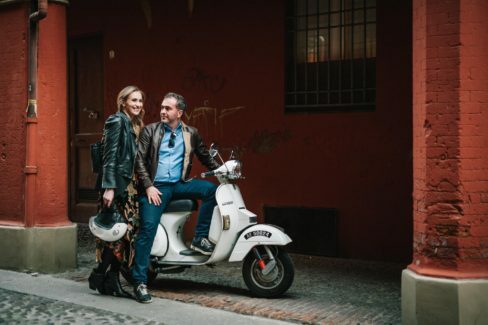 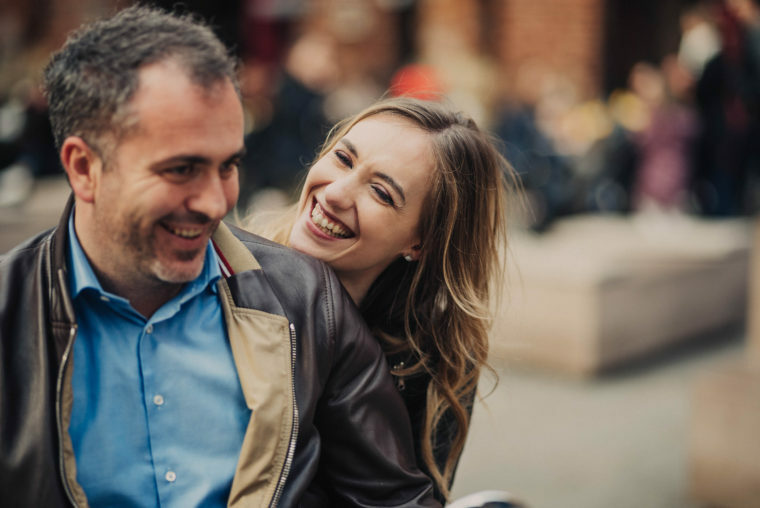 And just to add more charm to this romantic engagement in Italy, Stefano and Alessia came riding a white vintage Vespa 125 px that belongs to Stefano’s Vespa collection. 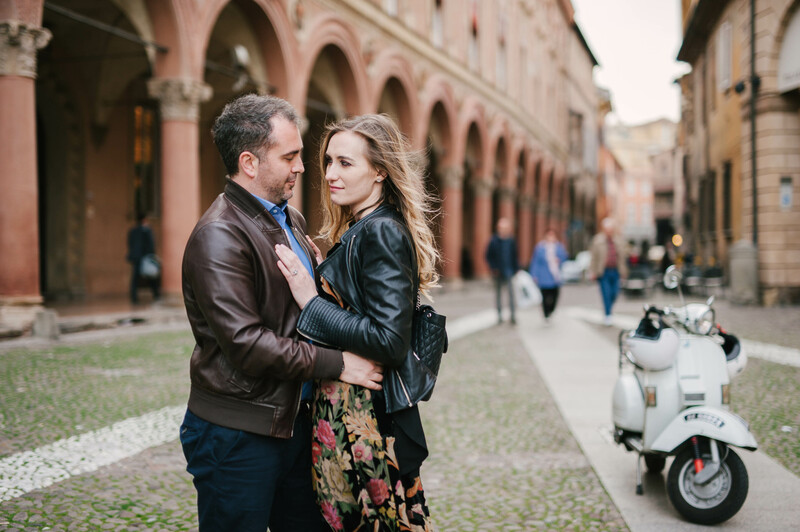 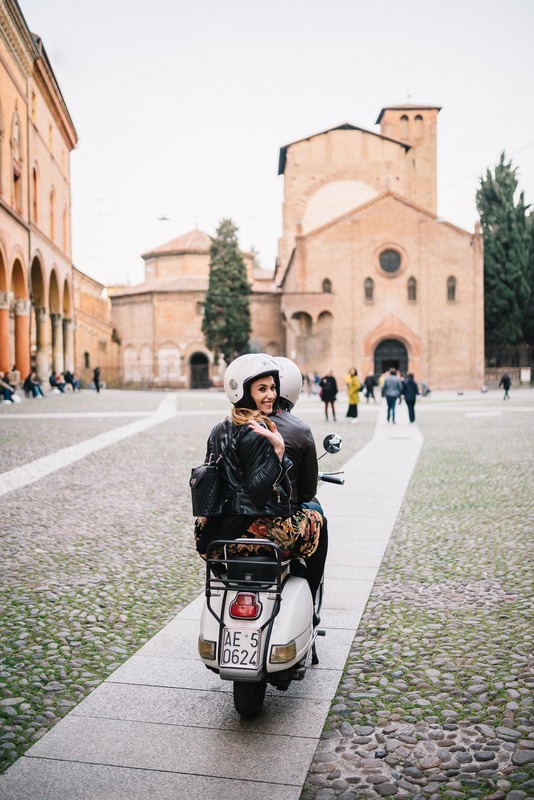 Well, after all, it’s not a perfect Italian engagement in Bologna without a Vespa, is it?